Originally published under the title, "Too Many Women Among Those Who Despise America and Hate Israel." Why do so many women hate Israel more than they hate Islamic gender apartheid? The Canary Mission is devoted to exposing haters of America and of Jews and boycotters of Israel. In a sense, it wants to "blacklist the blacklisters." The site, which first appeared in February of this year, thus far features both individual students, recent graduates, and professors-- as these people call for an "Intifada" in America (as Hatem Bazien did), as they rally and tell Jews to "go back to the ovens, you need a really big oven" (as a young student did at a demonstration). Every word belongs to the hater. Hateful speech and rallies have been filmed; excerpts from self-published websites, Facebook pages, Twitter accounts, and student newspaper op-ed pieces have been brought together. The guilty parties expose or convict themselves with their own words and by their faces of rage and scorn. They also proudly list their membership in known Muslim Brotherhood-linked groups such as CAIR and the Muslim Student Association. took a page from the New Israel Fund, which some years ago helped finance the Coalition of Women for Peace that created that Who-Profits database that acted as a global compass of Israeli commercial activity for Boycott, Divestment, and Sanctions strategies. Canary flipped the card and blacklisted the blacklisters. Might would-be employers want to see their potential employees in action? In some cases, maybe they will want to hire just such haters; in other cases they may be unwilling to do so once they have seen and heard what they had to say. 58% of the activists profiled by Canary Mission are women. Some of the individuals featured so far are highly "esteemed" professors, such as Hatem Bazian, Lila Abu-Lughod, Omar Barghouti, Juan Cole, Rashid Khalidi, Joseph Massad, Denis Sullivan, Nina Tannenwald. They will not lose their jobs. They are prized precisely for such views. However, the majority of individuals shown here seem to be student activists. 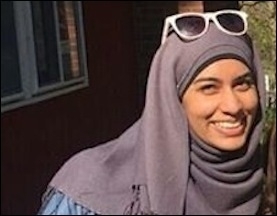 Lamiya Khadaker, who started the killer bee swarm against Professor Andrew Pessin at Connecticut College, is pictured. 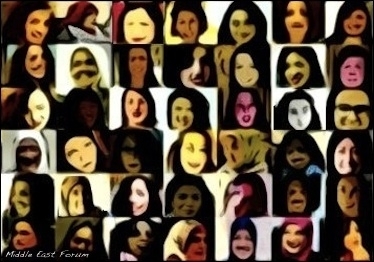 Why are the female students and professors utterly silent about the daily and hourly atrocities being committed against girls and women in Iraq, Iran, and Afghanistan? Why no word against gender and religious apartheid, no condemnation of FGM, from these people presumably so concerned with justice?